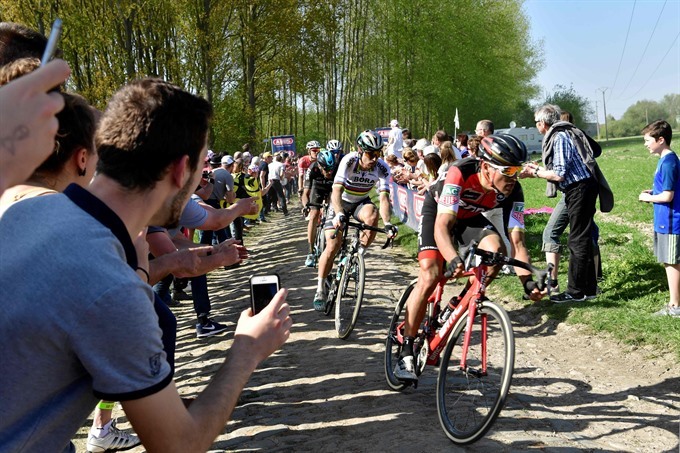 ROUBAIX — Winning Paris-Roubaix may be the dream for many cyclists but new champion Greg Van Avermaet would still prefer success at home in Flanders. The 31-year-old took his first ’Monument’ victory at the ’Hell of North’ on Sunday, outsprinting Czech Zdenek Stybar and Sebastian Langeveld of the Netherlands in the iconic Roubaix velodrome. But despite earning one of the biggest successes of his life, Belgian Van Avermaet said he’s won a greater title and admitted he would still prefer a victory at the Tour of Flanders. "For me the Olympics is always going to be my biggest victory but it’s nice to have a Monument now, otherwise you’ll keep asking: ’when are you going to win a Monument’," Van Avermaet told journalists in Roubaix. Until this victory he had many times been the nearly man in Monuments, twice finishing second at the Tour of Flanders amongst four top four results, while he was third at Roubaix in 2015 and fourth two years before that. "I’m happy that finally I’m in this (winner’s) spot. I tried for several years to be sitting here, winning these races -- I always believed I could do it." But winning in Flanders, where last week he was second despite a late crash, would top Paris-Roubaix success. "I was disappointed after the (Flanders) race for sure because I was starting with the idea that I was going to win," said the 31-year-old. "If things happen and you come second, you have to be disappointed if you had the legs to win. "But the day after I was the first guy to be happy. I have to say it’s been a great season so far. "I wasn’t really down, it’s just the way things go -- sometimes you win, sometimes you lose. I was motivated to do other good races. "To be honest, I wasn’t expecting to win Roubaix. I was going with good motivation to try to do my best and go as far as possible, as I always do. "Maybe I wasn’t expecting to win but I’m really happy I have Roubaix and next year I will try again for Flanders." Van Avermaet has come on in leaps and bounds over the last two years, winning stages at the last two editions of the Tour de France and last July even wearing the leader’s yellow jersey for three days. Last year he also won his first ever stage race -- Tirreno-Adriatico -- before adding the Olympic crown in Rio de Janeiro. And this season he’s been in a league of his own in the spring one-day classics, winning Omloop Het Nieuwsblad, E3 Harelbeke and Gent-Wevelgem while also claiming second at Strade Bianche. And he’s not finished yet as he looks to switch his attention from the cobbles to the Ardennes. "Next week is Amstel (Gold), it’s a race I like. I also have a feeling I can do something there. "I will try to enjoy the moment but Amstel is on my programme.